31 October 2014. A biodefense unit of the U.S. Department of Defense awarded a contract to vaccine maker Profectus BioSciences Inc. for development and testing of a vaccine protecting against the two major Ebola strains and related Marburg viruses. The $9.5 million contract with the Baltimore company came from DoD’s Medical Countermeasure Systems-Joint Vaccine Acquisition Program, through Battelle Memorial Institute. The work involves further development and preclinical testing of a single vaccine protecting against the Zaire and Sudan strains of Ebola, as well as the related hemorrhagic Marburg virus. Preclinical testing is expected to lead to an investigational new drug application with the U.S. Food and Drug Administration to conduct human clinical trials of the vaccine. FDA is authorized to grant emergency approval for clinical trials in situations where conditions call for a rapid decision. Profectus BioSciences’ vaccine technology is licensed from research at the lab of Yale University virologist John Rose that genetically engineers viruses to reduce their effect, while providing a delivery mechanism safe for humans. Used alone the technology, says Profectus, leads to rapid expansion of immune-system B cells, and with an engineered DNA booster, also stimulates T cell production. The company first applied this technology to a vaccine for HIV that in preclinical and early clinical studies is shown to be safe and induce an immune response in both HIV-positive and negative individuals. About 5 years ago, Profectus began work on applying this technology to Ebola and Marburg viruses, with Thomas Geisbert at the University of Texas Galveston National Laboratories and Heinz Feldmann at NIH’s Rocky Mountain Laboratories in Montana. 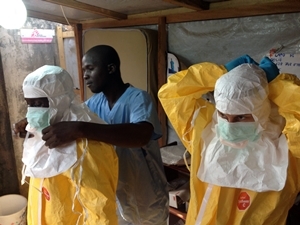 The collaboration, says the company, led to studies with lab rodents and monkeys showing single doses of the vaccines protecting against the Ebola Zaire strain and Marburg viruses, up to 1,000 times the lethal exposure. Including the new contract, Profectus received $37.4 million for development of Ebola vaccines since March 2014 from DoD, NIH, and other agencies. The most recent contract, of $8.6 million, was awarded on 22 October from the Biomedical Advanced Research and Development Authority in Department of Health and Human Services to advance Profectus’s vaccine for the Ebola Zaire strain into clinical trials.